Recently, I ran across an older volume of tanka entitled Imperial Japanese Poems of the Meiji Era. Published in 1914 in English and translated by Frank Alanson Lombard, the volume contains the work of Emperor Meiji and the Empress Dowager Shoken. The Emperor was said to have written over 100,000 waka and the Empress over 30,000. How hard to sweep the shadows! I continued to look through the collection and yet nothing came close to this initial randomly selected piece, by either the Emperor or the Empress Dowager. Perhaps it is the translations by Lombard; the poems found here by both are fairly interesting. I'll continue to page through the 1914 volume and read the work of both poets, but, well, sometimes serendipity is all. Thanks for sharing your moment of serendipity. Love the poem. 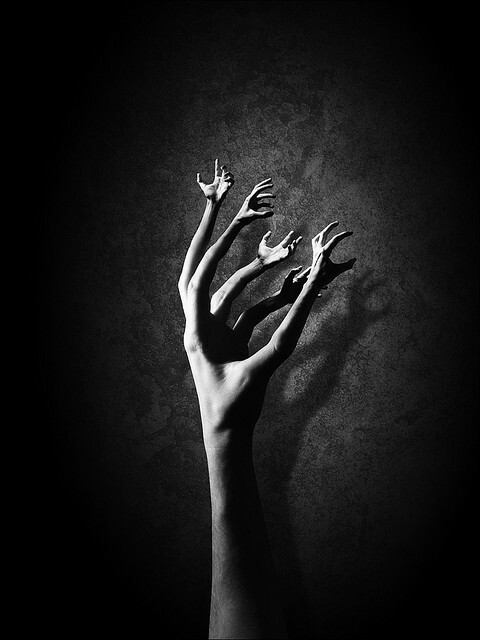 Reminds me of the one by Emily D. that talks of the mind slipping out of its groove. Hmn, that's a fine comparison - there are many a ED poem that have a bit of the tanka glimmer about them ... and vice versa. Thanks for sending this along ... fine poem. This is a very successful juxtaposition between the tanka of Empress Haruko (Shoken) and the haiku of Issa's. I've been immensely interested in the Meiji Era since I was a college student in Tokyo. I find the Meiji Woodblock prints to be fine examples of the changes in Meiji with the sudden appearance of steamer ships, trains and horse & buggies. 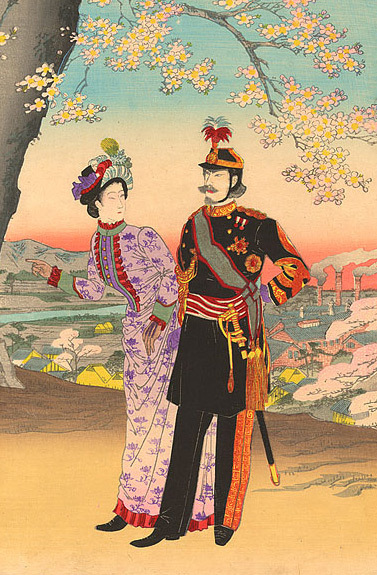 I read that the Empress Meiji began wearing dresses in 1889. The elegance of the kimono is enduring, but considering the time it takes to put on, the limitations in walking, and the tightness of the obi, the change to Western clothes clothes was liberating for her majesty. 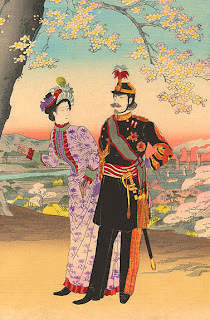 Donald Keene's history book, Emperor of Japan: Meiji and his World 1852-1912, includes the emperor's tanka in it. However, they seem dry and lifeless. Whether that is the fault of the original or the translation or both, I don't know, but translating poetry is completely different from translating non-fiction. .... fast forward & things yet not much different ? Japanese woodblock prints... do check-out David Bull via this film. click the image then go full screen. Viewing the amazing woodblock video now, Ed. the collector/viewer ..... well, it's up to they-selves the rest ? I have about 125 of them in a box ... these guys have marketing help.... and deservedly so. they limit the last 'pledge' to 12 people ... all of the prints PLUS a party-workshop with David Bull. notice the beautiful piece of wood that he is working on ? I wonder if it is the same block that the carver did under the eye of Utamaro ? equipment to ink and run-off single sheets of a poem.... sometimes we inked, separately, three different colors ... as I recall, these were called "broadsides"
Thanks so much for these links - incredible, incredible work by David Bull. Thanks again for this, Ed. Watched David's videos and was mesmerized. Total immersion ... I may try to feature one of the videos on the blog so as to properly point people to all of them, since it's probably you and me and outside a handful of others reading the comments.